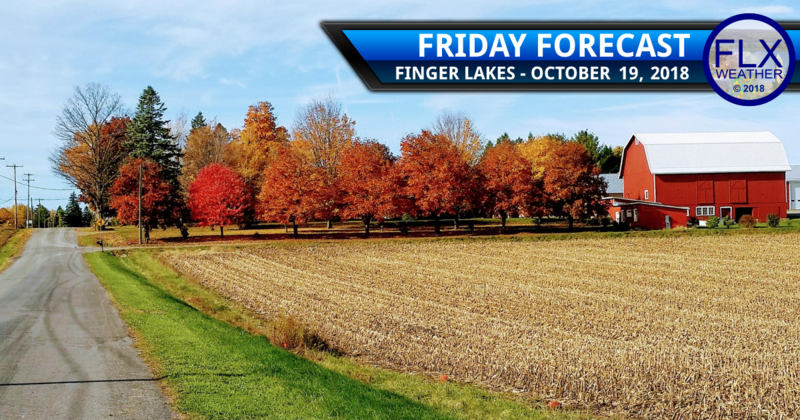 After a week of rain, snow, wind, and below normal temperatures, Friday will turn out to be a very pleasant day across the Finger Lakes. Temperatures vary quite a bit this morning across the region. The northern Finger Lakes has warmed into the upper 30s and low 40s as the southwest wind blows down slope off of the Allegheny Plateau. Meanwhile, some of the valley locations across the Southern Tier are starting out in the upper 20s. As the sun comes up under mostly clear skies, the temperatures will rise quickly and become more uniform. On average, temperatures will be around 60 degrees today. Northern areas will climb a couple degrees higher while the Southern Tier stays a couple degrees cooler. These temperatures will be a touch above normal, but no where near record levels. The wind will be noticeable, but not too strong. Expect top gusts between 20-25 mph across the northern and eastern Finger Lakes and between 25-30 mph to the southwest. The wind should increase slightly this evening. Sunny skies will persist through the morning and into the early afternoon. Then, some thin clouds will start to work in and will steadily increase and become thicker. Skies should become rather overcast by the evening. A few showers will also start to become possible after sunset. Temperatures will remain warm this evening with the wind and clouds. Look for low 50s across the north and upper 40s to the south. A strong cold front, which this morning is all the way back over the northern Plains, will move through the Finger Lakes Saturday afternoon. Out ahead of this front, periods of showers will continue through Friday night and into Saturday morning. It will not rain the entire time, but several waves of showers are anticipated. The precipitation should become more sporadic during the afternoon, though a couple of heavier downpours may accompany the frontal passage. Temperatures will top out in the low and mid 50s during the early afternoon before tumbling back into the 30s before midnight. After the front passes, there should be a lull in the activity late in the afternoon and into the early evening hours. A stray, brief shower may still be possible, but most areas should see a dry evening. Lake effect will fire up Saturday night, especially towards Sunday morning. Initially, the precipitation will be a few scattered rain and snow showers, but by Sunday morning, a wider spray of mostly snow showers will exist across the region. These snow showers will not be constant, but rather it will likely snow for a brief time, then stop for a while, then snow a bit more. The snow should dissipate by the early afternoon, leaving mostly cloudy skies. A coating could accumulate even over lower elevations while higher elevations, such as the Bristol Hills and higher elevations northeast of Ithaca, could see an inch or two. Temperatures Sunday should start generally in the low 30s. Afternoon highs will only reach the upper 30s to perhaps 40 degrees near Lake Ontario.